In October 2008, we started with simple “finger weaving”, and produced narrow bracelets. These women, whose hands were familiar with field work, cooking and raising children, began to get a sense of how to work with fine threads. 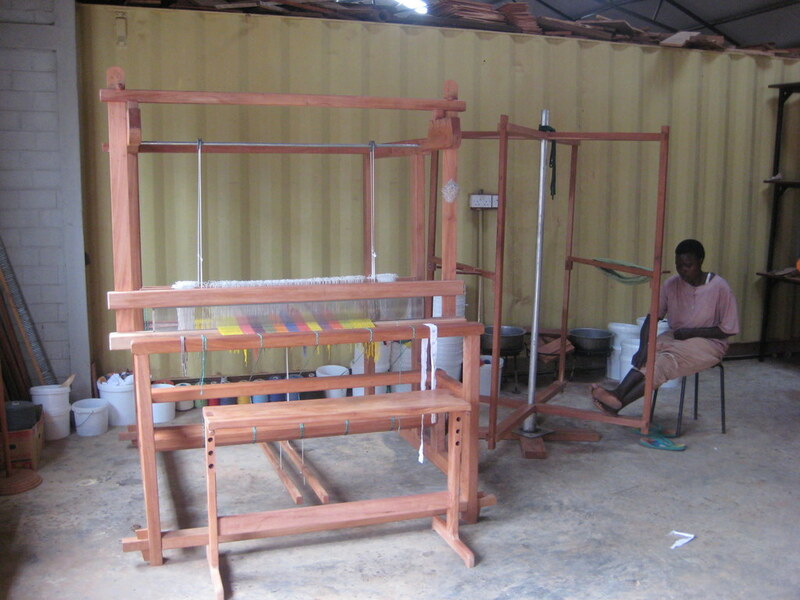 Meanwhile, the looms and accessories were being made in the neighboring wood workshop. Soon, the first loom was set up, and the first fabrics began to appear. Gradually the other looms were completed; before long, the space we were borrowing from the wood workshop was completely full. Production and sales developed so well that we had to hire a woman, Juan, for the preparation and finishing work such as dyeing and making fringes. Next we realized we needed someone to focus only on sewing, so we hired a seamstress. Space was tight in our workshop; we wanted to add another loom, but there was simply no space. We were also due to give the place back to the wood workshop. Moreover, it was very noisy and dusty in our workshop, which for not good for our equipment, for our young children or for ourselves. For all of these reasons, we decided it was time to build our own workshop. By October 2010, we were ready to move in. Now the workshop is full with looms, knitting machines and sewing machines. 20 women have work and get constant income. We got a small nearly round house for coloring our yarn. The coloring ladies, Sandia and Juru, are more confortale, the sunheat and the rain arn’t any more disturbing her work. They have a bath tube and running water there, which simplifys her work. A Twisting Machine twists our very thin organic cotton threats from Uganda together to be strong enough to be put on the looms. In October 2013 we opend a small showroom at the compound of the Comboni Missionaries in Juba, the capital city of South Sudan. We have many international customers who like to buy our products to take something ‘Made in South Sudan’ home. Resellers in Kampala/Uganda order regularly products and sell them in and around Kampala with success. Since end of 2014 Finespinners Uganda provides us colored twisted cotton yarn in very good quality grown and processed in Uganda.